The High Fidelity Cables MC-1 Pro uses Magnetic Conduction in a unique way, different from most other High Fidelity Cables products. 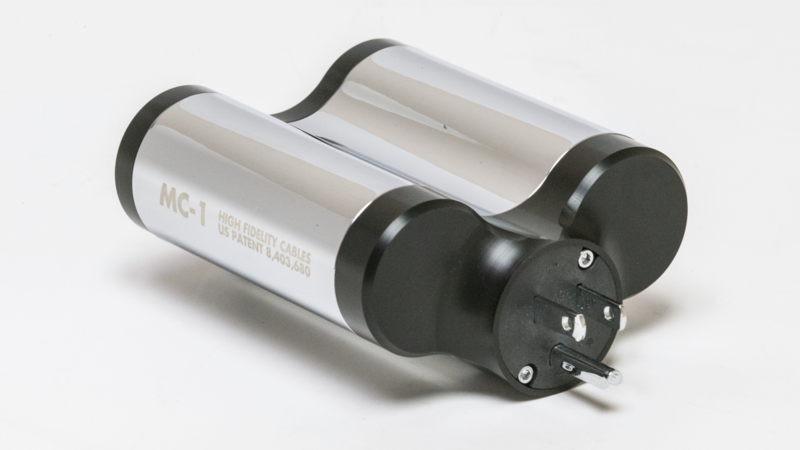 Incorporating technology developed from their Pro Elite Power Conditioner and using aspects of their newly patented capacitor design, the MC-1 Pro power conditoner couples the power of traditional capacitor filtering with our most powerful magnetic wave guides. The capacitor itself is too small to filter AC on its own, however coupled with the magnetic wave guides it acts to both center electrons within the wave guide as well as draw some energy into and through the wave guide. This makes for a level of magnetic filtering unique to this device. Reduced harshness, edginess, greater resolution and improved dynamics due to lowered high-frequency distortion. Images have a better, more defined trailing edge that lingers in a natural way. Tone, speed and attack are also improved, and bass frequencies sound more like instruments and less like boomy, undefined energy. Every aspect of sound reproduction is improved by the MC-1 Pro. Adding additional units helps to continue to even further lower noise, so the MC-1 Pro is designed to stack, allowing two or more units to be used together in a plug or power strip. A serious upgrade for a serious system and audiophile. This unit can also be used with traditional power supply devices like regenerators, isolation transformers, and capacitive-based power conditioners of any type. MC-1 Pro cannot be used directly in ground fault interrupters or "GFI" receptacles or breakers common in parts of Europe. All High Fidelity Cables devices work based on lowering distortion, and take time to bring the musicality to an end result. When you first install the MC-1 Pro you will hear a reduction of overall sound - This is distortion removed that had cloned the audio signal. Within hours the MC-1 Pro will start to open up and reveal more and more music. Full break-in does not occur until 400 hours or more, and during this time the device should not be removed. If removing to do A/B comparisons, let the system settle for 24 hours before analyzing the sound as the device has a lingering effect. Upon reinstallation, also wait at least 24 hours to evaluate. Changes are immediate, but the net result of lowing distortion takes time to reveal its benefits, as many audiophiles have learned. Click the button below to add the High Fidelity MC-1 Pro to your wish list.